I earned my Ph.D. from Columbia University in the History and Education program at Teachers College, and am a Research Fellow at the Institute for Urban and Minority Education (IUME). My current scholarship examines the history of an alternative high school, called Harlem Prep, that educated nontraditional students of color that had been pushed out of school from 1967-1974. The Harlem Prep Project seeks to uncover the history of this remarkable institution, with the help of alumni and other supporters. Although a historian by training, I am also interested in the intersections of youth learning and youth culture-- theories of empowerment and in the improvement of students' academic literacies -- with public history and historical methodology. My previous Youth Historians in Harlem (YHH) project explored these boundaries, merging the idea(s) that youth can "do" rigorous historical research in ways that empowers and builds real-world skills of youth while also demonstrating the benefits of collaborating with young people in university spaces. I am passionate about the power of education and the brilliance of our youth -- and always center my research around the idea that we underestimate their enormous, untapped potential. Digging deeper, however, I hope to be more than these academic confines, shaped by my varied life experiences living and learning in the St. Louis, in New York City, and now back in Los Angeles. I am a proud first-generation student who is the first in my family to receive a 4-year degree, and care deeply about similarly helping my students access — and succeed in — higher education. I strive to be a critical theorist with a stream of pragmatism; an independent-minded thinker; the ultimate idealist yet an admitted realist; a dedicated educator and listener; and most of all, a committed writer. Writing is my freedom. I am extremely fortunate and privileged to have the opportunity to write -- to write about my research and ideas, to write history and "the past," and above all, to write about what I believe can change how we think about the world around us. + Goldenberg, B. M. (2018). “Rethinking Public History and Community Practice: Learning Together With Youth Historians.” Rethinking History. + Goldenberg, B. M. (2018). “‘There’s A Lot To Know, And We’ll Learn It Together’: Emancipatory Teaching and Learning at Harlem Preparatory School, 1967-1974.” In Rearticulating Education and Social Change across American History: Teacher Agency and Resistance from the Late 19th Century to the Present. Edited by Jennifer de Saxe and Tina Gourd. New York: Routledge. + Goldenberg, B. M. (2016). "Youth Historians in Harlem: An After-School Blueprint for History Engagement through the Historical Process. The Social Studies 107 (2), 47-67. + Goldenberg, B.M., Wintner, A., & Berg, C. (2015). "Creating Middle School Harlem Historians: Motivating Urban Students Through Community-Based History." Voices From the Middle 23(1), 73-79. + Generations of Giving: The History of the Cleveland H. Dodge Foundation. New York: Teachers College Press, 2017. Written in partnership with the Cleveland H. Dodge Foundation, located in New York City, this book explores the history of the Dodge family philanthropy from the early 1800s to the present, as well as the history of the Foundation that was established in 1917. This book, published by Teachers College Press, is a limited edition and was presented at the Dodge Foundation Centennial celebration in New York, NY, on September 16, 2017 at the University Club in Manhattan. + The Story of Harlem Prep: Cultivating a Community School in New York City. The Gotham Center for New York City History. Aug. 2, 2016. + Talking Inclusion? Include Our Students. TC Today Magazine 39 (1), 64. Fall/Winter 2014. 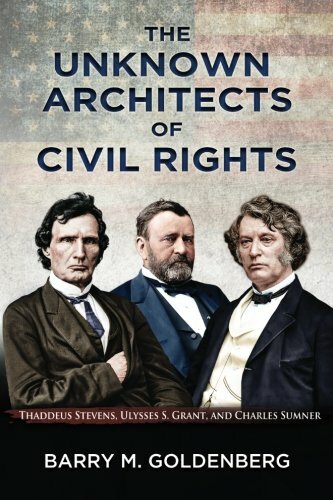 + The Unknown Architects of Civil Rights: Thaddeus Stevens, Ulysses S. Grant, and Charles Sumner. Los Angeles: Critical Minds Press, 2011. (self-published). Updated edition in 2017 with new author foreword now available! BACK COVER: "Winner of the prestigious Carey McWilliams Prize for best Undergraduate Honors History Thesis at the University of California, Los Angeles (UCLA), The Unknown Architects of Civil Rights is a groundbreaking book that re-examines three of the most influential—but largely forgotten—civil rights leaders in American history. As civil rights history continues to hold a prominent place in American society, it is only through the courageous actions of Thaddeus Stevens, Ulysses S. Grant, and Charles Sumner that America’s most prized Civil Rights gains are emblazoned in our Constitution. Without these powerful and then-famous politicians, the 1960's Civil Rights Movement would not have occurred the way it did--or possibly even at all. During the Reconstruction Era when racism and prejudice was at its height, Stevens, Grant, and Sumner valiantly fought for African American equality only years following the institution of slavery. The Unknown Architects of Civil Rights brings to life the personalities, the struggles, and the legacies of three men who strove towards America’s claim of 'liberty and justice for all' during this unprecedented time in our nation’s history." Although my opportunity to write freely--free of academic jargon and free of the confines of the Academy--is, unfortunately, too infrequent, I do occasionally have been able to blog about various life topics over a blog that I have kept, dating many years back. While an introduction of my blog can be accessed here, below are a few of my more memorable accounts that I have re-constituted: . June 9, 2018 -- On my 30th birthday, and in between two jobs where I interact with peoples' dreams in different ways, I wrote a post about the importance of continuing to dream and helping others reach their dreams. "Love is Real, Real is Love"
August 18, 2016 -- After spending more than a week in Los Angeles visiting with my mom and going through old school work, I was motivated to write a blog about some of thoughts about the role of love in society. June 9, 2016 -- Inspired by family and friends, a short reflective post about the power and potential of kindness. One of my favorite posts that I often return to in moments of reflection. August 14, 2014 -- A reflection, on the anniversary of my grandfather's passing, about the meaning of the "unwritten words": the words that define us as humans when few are looking and when doing the right thing is often the hardest. Re-thinking the American Dream for the "Millennial Generation"
March 12, 2013 -- A short call to action to people of the so-called "Millennial Generation" to work together to achieve the type of society we all hope for in an era with seemingly unprecedented challenges. September 24, 2012 -- A older, but timeless, reflection on the moments that, at first thought, seem inconsequential but are often the moments with the most life meaning and leave the greatest impact..
My dissertation uncovers the unknown history of Harlem Preparatory School, an independent community school that existed in Central Harlem (NY) from 1967 to 1974 that educated students who had been pushed out of the public school system. Held in a repurposed old supermarket with blackboards as developed and staffed by diverse group of largely non-credentialed teachers, the school graduated — sent to college — almost 800 students during its independent tenure. Through the eyes of its students, staff, and administrators, I humbly seek to tell the story of Harlem Prep, analyzing the school’s multiculturalism in the context of the other alternative Black institutions emerging during the era. This research adds to nascent scholarship of the era in terms of different strands of the black freedom struggle in education and the role that multiculturalism played. Above all, however, I hope this story can help scholars and educators re-imagine what powerful teaching and learning looks like and share the untapped brilliance of youth. In addition to my dissertation and publications, I also created the Harlem Prep Project: in part an online (and in progress) partial database for Harlem Prep, collecting the stories of alumni and other historical documents. More importantly, it serves a digital "space" to connect with alumni and conduct this work in "public" together, sharing my research progress and more. The Harlem Prep Project is currently my main research endeavor, both completing the dissertation but also re-conceptualizing what public history looks like in a digital space. The Youth Historians in Harlem (YHH) project is a critical approach to teaching history, focusing on empowering youth through their own cultural experiences and involving students in the practice of "doing" history through participatory action research. I founded the Youth Historians program in 2012 via a Dean's Grant for Student Research at Teachers College, Columbia University, and directed the program for four years from 2012 to 2016. While YHH sought to increase students' interest in history and academic literacies by authentically participating in critical historical dialogue, the program also pushed the boundaries of what constitutes knowledge in the Academy and the importance of collaborative research between young people and scholars. After founding the program and directing it for four beautiful years, YHH is now under new direction and continues at Teachers College. For more information about past years of YHH including pictures and curriculum insights, visit youthhistorians.com. In addition, please visit "publication & writings" for various published scholarship relating to my past research on Youth Historians in Harlem. It is the work of teachers that changed my life—and it is now a wonderful privilege to now teach myself. I have taught in a variety of capacities, and strive to be an inspiring and collaborative educator with my students. My teaching philosophy is based on three pillars: cultural relevance, technological integration, and revolutionary love. Informed by decades of research on culturally relevant pedagogy and multiculturalism, my courses center women, people of color, and other marginalized groups to explain the American narrative. Moreover, my classes rely on students’ lived experiences and their rich linguistic, cultural, and aspirational capital that they bring. I believe that technology — mobile phones and beyond — should be utilized as learning aids and to promote learning. Technology is a part of students’ lives, and in our increasingly digital world, students should be able to use their media literacy for academic engagement. My courses include frequent use of Prezi, Canvas, Hypothes.is, Omeka, and more. Love is at the root of all learning, and as Ernest Morrell and Jeffrey Duncan-Andrade explain, educators must teach with a “revolutionary love” that can bring radical change in classrooms. I teach with an abundance of love for every student who walks into my classroom, and believe deeply in valuing, respecting, and affirming young peoples’ dreams. I currently teach history at El Camino College in Torrance, California as an adjunct instructor in the history department as well as part of the college’s First Year Experience (FYE) program. I have also taught dual enrollment classes at local public high schools in the Inglewood School Distrcit. My current courses include: United States History to 1877 and United States History: 1877 to the Present. Click below to view sample syllabi from these two courses. I also have plans to teach courses such as History of Social Movements, History of Education in the United States, and other courses related to urban history. Working with young people in New York City, 2013. Over the course of four years, I founded and directed the Youth Historians in Harlem (YHH) program at the Institute for Urban and Minority Education (IUME) at Teachers College, Columbia University. YHH served local public high school students in Harlem, and from 2012-2016, I designed curriculum and created lesson plans that sought to teach students the history of their community. Lesson plans ranged from issues on urban policy, to civil rights activism, to gentrification, and more. Teaching in this capacity provided an excellent foundation for crafting my pedagogy and codifying my teaching philosophies. For more information about my teaching in YHH, please visit the archived Youth Historians website. Starting in the Fall 2018 semester, I have been hired as a part-time faculty member at El Camino College in Torrance, CA. El Camino College, which serves more than 25,000 students each year in the South Bay and larger Los Angeles County -- a majority of them first-generation college students -- is the second leading transfer school to UCLA in the state of California and one the leading institutions for serving Latino/a students. I am very proud to teach at this wonderful institution and join a group of faculty members who are extremely committed to student well-being and success. My course syllabus and other information can be viewed here. After almost two years of researching and writing, my book, entitled Generations of Giving: The History of the Cleveland H. Dodge Foundation, humbly published by Teachers College Press, was released at the Foundation's Centennial Celebration at the University Club in Manhattan, NY. In front of almost 200 people, including President Susan Fuhrman of Teachers College, Columbia University, I hand-signed each book and spoke to the audience about my writing process and the main components of the book's narrative about the Dodge family's philanthropy and the Foundation throughout the twentieth century. It was an honor to have been a part of this event. In support of my dissertation work, I was awarded a year-long fellowship, starting in Fall 2017 and extending until Spring 2018. According to Teachers College's Office of Student Affairs wrote, they "received a record number of applications this year" and I am appreciative of this opportunity to represent Teachers College as one of few students who received one of these awards. To accompany my co-written article entitled "Middle School Harlem Historians" in Voices from the Middle journal, I was interviewed in podcast format to discuss how the article took shape, how the discussed program motivates students, and other key concepts of the Middle School Harlem Historians project. Click here to listen to the podcast. In the bi-annually printed TC Today Magazine, the official magazine of the Teachers College, Columbia University, my article entitled, "Talking Inclusion? Include Our Students" discusses the importance of including students in policy decisions. Click here to read the short article. I was selected to participate in the 2014 Teagle Summer Institute at Columbia University. The Teagle Summer Institute is an "intensive, multi-day series of workshops, discussions, and posted reflections all centered on the use of emerging tools to support effective teaching," where participants will interact with graduate students across the University to design innovative teaching projects. I have recently been awarded, in partnership with colleague Andrew Wintner, an ING Unsung Heroes Grant for $2,000 to conduct their "Middle School Harlem Historians" (MSHH) program. This program will be an after-school intervention program that seeks to improve middle school students' literacy skills through engaging in history. Andrew and I were generously awarded plaques and a commemorative check from ING. (Andrew is a 8th grade English teacher.) Only three projects in the entire state of New York received funding. Click here to learn more about ING Unsung Heroes. In an article from Teachers College Media Center, I was featured in regards to my journey from St. Louis all the way to New York City and Columbia University. In addition, the article was featured on Teachers College's main website and in its online magazine section. Click here to read the article in TC People Magazine. I was interviewed on the Harlem World Radio Show with host Danny Tisdale, talking for 30 minutes about the Youth Historians in Harlem and the history of Harlem in general. It was a great, engaging interview that discussed the Youth Historians project from a variety angles. I am available for consulting and/or research opportunities in education and history. In addition, please feel free to drop a note in regards to general questions or comments about my work. I believe strongly in collaboration and eager to foster new relationships with people and institutions who are dedicated to lifting up the dreams of our young people. © 2015 Barry M. Goldenberg All Right Reserved.